Requires cell phone/PDA with a Chinese character set. Chinese -> English: enter Chinese characters (both traditional and simplified work) or pinyin with tone numbers (e.g. "ci2 dian3") or pinyin without tone numbers (e.g. 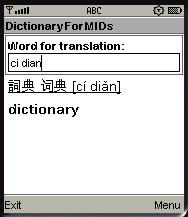 "ci dian") or pinyin with accents (e.g. "cí diǎn"). Do not mix the pinyin variants (e.g. "ci2 dian" will not work; "ci2 dian?" will work). Use the / at the beginning or end to turn off substring search. E.g. /ci2 will find all words that start with ci2 such as "ci2 dian3", but words with ci2 in the middle or end of the word will not be found (e.g. "bian3 ci2" will not be found). Note that that after too many hits the search is stopped with the message "max nr. of hits reached".